It takes me less than an hour to cook breakfast and lunch for the day if I am in a good mood and I have the menu ready in my mind.I agree to every one who says it is the menu part which takes up all of the time.Which ozhichu curry(gravy)to make and what upperi(side-dish)will go with seems to be a daily issue.I try and decide it the previous night itself so that kitchen time is minimal.It is scorching summer here in Chennai and even the tadka heat becomes unbearable. I rely on my Mallu friends when it comes to authentic malayali curries and this one is no different.My friend Ramya made this for lunch one day and I just couldn't guess what was it that made it different from the regular Kumbalanga pulisheri that I make.While sour curd is used for puli in pulisheri,in this curry the souring agent is raw mango. 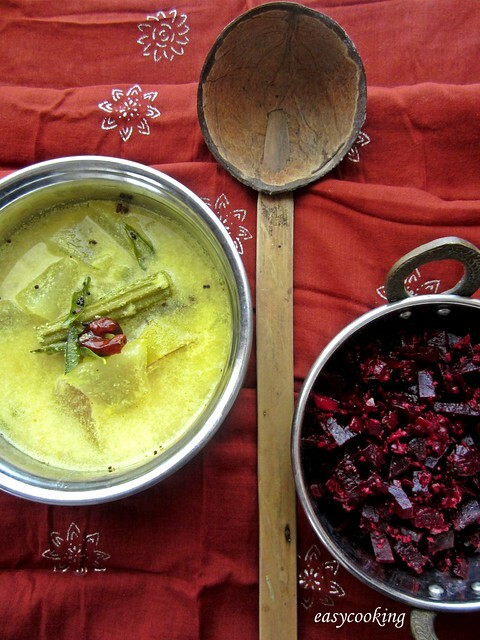 We love pairing pulisheri with beetroot upperi and it went well with this pulingari too. Cook the toor dal in a pressure cooker with enough water till 2-3 whistles or till the dal becomes mushy. Add in the chopped vegetables and the raw mango and cook for exactly 1 whistle. Meanwhile,make the masala with the ingredients mentioned.Grind to a smooth paste. Mix in the ground masala and salt to taste and bring the curry to a boil.Simmer for 5-10 minutes. Prepare seasoning in a pan with oil and splutter mustard seeds.Add red chilly and curry leaves and pour the tadka over the boiling curry. Switch off flame and serve hot. In a thick bottomed kadai add oil and splutter mustard seeds and add green chilly followed by onion. Saute onions till golden brown and mix in the chopped beetroot.Add around 1/4 cup of water and salt to taste,close with a lid and cook for 5-10 minutes or till the beetroot is cooked.Mix in the grated coconut. Serve with rice and pulingari. both the recipes are really nice..and i agree it becomes really tough to just figure out the meals each and every day!!!!! you are right planning ahead does half of the job. Just when I had another pulinkary in my drafts, you posted this :D We do think alike! Yours look yum!!! Sure comforting meal...sounds new and interesting to me. 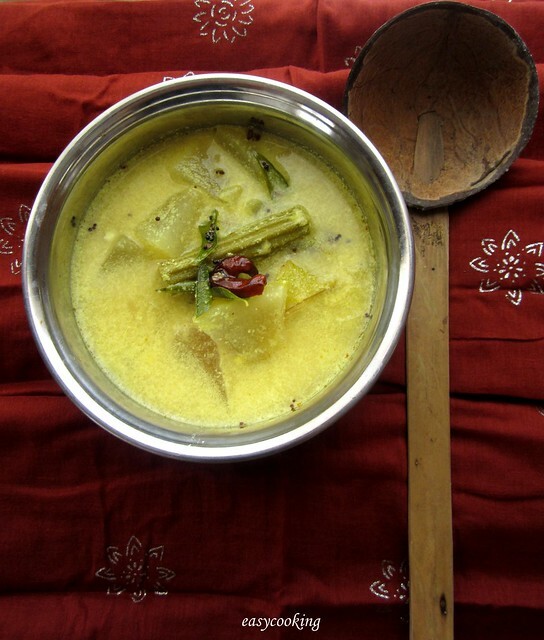 Lovely recipe & lovely clicks too .. Whenever you want a meal that is masala free, you know the onion-garlic kind, a good south indian meal is so welcome. I so agree that cooking does not take much time if you know what to make. I too decide the night before, makes it much easier. I love pulisseri with any upperi. Comfort food any day. 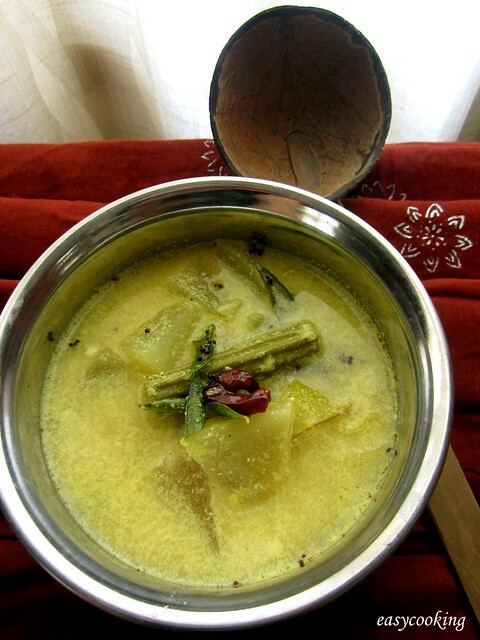 Never tried ash gourd with drum stick. Drumstick and beet upperi are my fav. Lovely post Divya. I actually loved the little ladle made with the coconut shell.